It takes four years maturing in a barrel under the Caribbean sun to create the unique taste of BACARDÍ Añejo Cuatro. It's time well spent. Just like those special moments shared with friends enjoying Añejo Cuatro. While other cocktails are garnished with olives or cherries, it's traditional to serve the Air Mail with a postage stamp. Stuck on the edge of the glass or placed to one side, it's always delivered with style. An inspired reimagining of the 1920s classic. 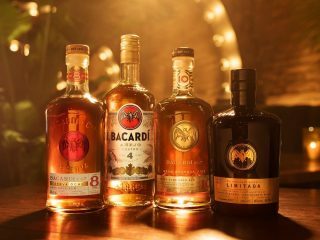 The BACARDĺ Cuatro Presidente is a delicious rum cocktail pairing the sweet sensation of BACARDÍ Añejo Cuatro with the rounded flavor of Martini Rubino. Add orange zest to accentuate the tangy orange notes in the rum. The name simply means "I'll have the same." And no wonder it's a popular order. This classic combination of BACARDÍ Añejo Cuatro rum with soda and lime wedges is a light, easy drinking cocktail.